Hybrid Camera Revolution: Sony Announces 4K Full Frame A7s - How Does It Stack Up Against the Panasonic GH4? Sony Announces 4K Full Frame A7s - How Does It Stack Up Against the Panasonic GH4? This is a big turnaround for Sony. A couple of months ago, in an article entitled, "Sony: Consumers aren't quite ready for 4K recording", Sony executives were quoted as saying, "Some competitors have already introduced 4K recording models so it is a point of differentiation that we don’t have at the moment but we see the need for it." The headline number is clearly the ISO. In fact, the "s" in A7s stands for "sensitivity". It is clear that Sony is going to make the case that low light shooters should buy this camera instead of the GH4. But the rest of the specs aren't really competitive. An optional XLR input doesn't match an optional quad 4K HD-SDI output. 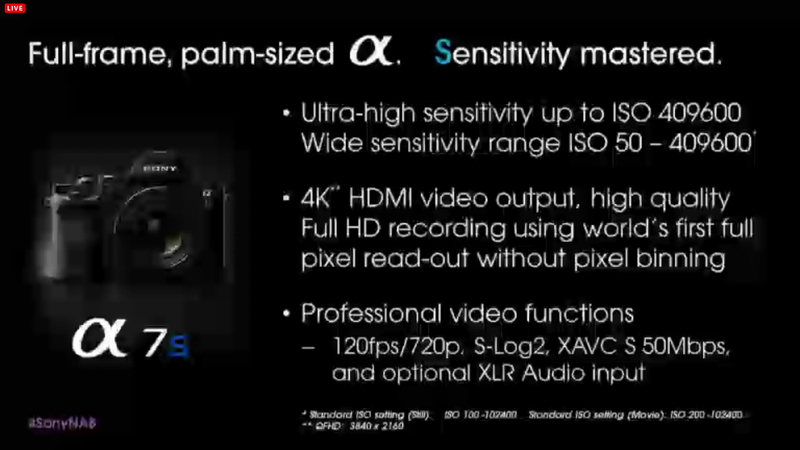 The A7s' slow motion will be a relatively lo-res 720/120p against the GH4's full HD 1080/96p. 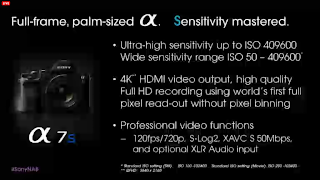 The A7s' XAVX-S 50Mbps will certainly look nice, but if it is 8-bit 4:2:0, it won't grade as well as the GH4's 100Mbps 10-bit 4:2:2 HDMI output. As for shooting LOG, the GH4's CineLike D will at least give S-Log2 a run for its money. The elephant in the room, however, is price. How much will this camera cost? If, like the A7r, it is a few hundred dollars over $2000 - I don't think they'll sell a lot of them. If, however, it is closer to the price of the A7, the GH4 may have a fight on its hands. Of course, that will kill A7 sales and create a lot of angry A7 owners. It will be interesting to see what Sony does. Really looking forward to getting to Vegas tomorrow! EDIT: Just saw that DJ over at DSLRFilmNoob is reporting that the A7s cannot record 4K internally and that the price will be $2500. If true, I don't think they're going to sell a lot of these cameras. EDIT 2: The press release seems to confirm that the camera records 3840x2160 to an external recorder and 1080p to the internal card. For cinema shooters who want DCI compatible 4096x2160 and prefer to record internally, this is a non-starter. It looks like the GH4 is the winner on resolution, internal 4K recording and price. EDIT 4: Andrew Reid at EOSHD is reporting that Atomos has announced the Atomos Shogun external recorder for the A7s. 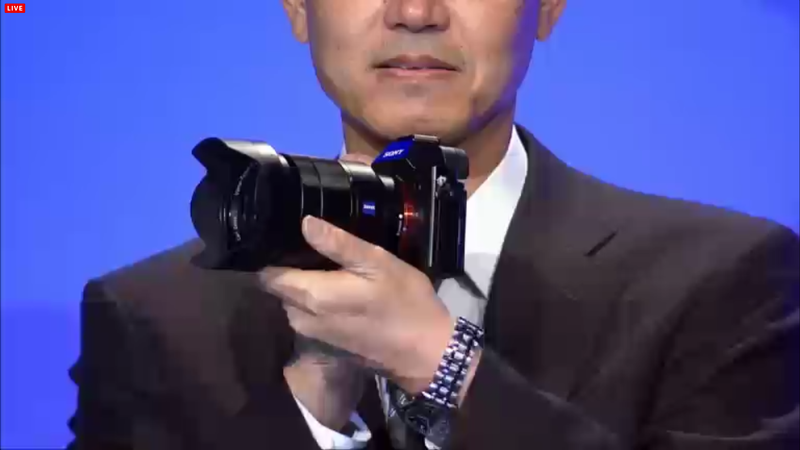 It will be "less than $2000" and will record the A7s' 8-bit 4K output as 10-bit ProRes. So you'll need to add a ~$2000 recorder to the A7s' estimated $2500 price to get 10-bit 4K (transcoded from 8-bit). That's a lot of money for a transcode. If you've been waiting to see what Sony would do before deciding to pre-order your GH4, and this post has helped you make a decision, please pre-order through one of the links above or the display ads below. It won't cost you anything extra, and it will help to keep these updates coming. Thanks! Selling my Pocket Cinema Camera for a GH4 - Why?